An entry for the RocketbeansTV BeansJam Mobile game jam 2018. Developed by one person in 48 hours using mainly free software. Please do not vote for this game in the game jam. 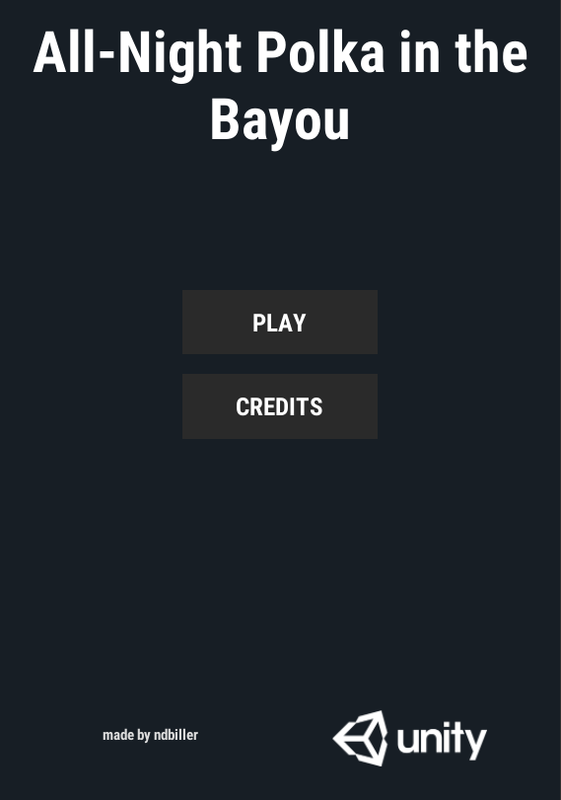 It mainly consists of free assets from a unity tutorial. Other teams have put far more creative effort into their projects. At the moment the game is still almost identical to the one offered in the asset store for free by Unity to help follow along with their 2D Roguelike tutorial. I tried to use the remaining time to individualize the game assets and to make something more original and Rocketbeans-related out of it but didn't have enough time on my own. Story: You are a travelling polka musician with a caravan of carnies. 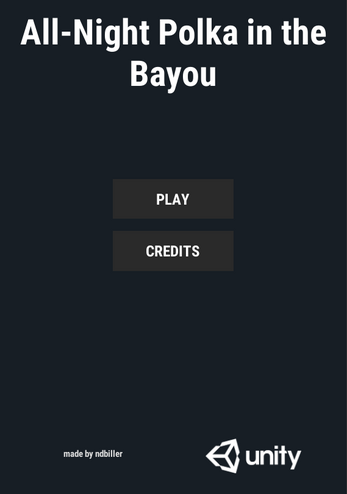 Your troupe arrives on the murky outskirts of New Orleans. 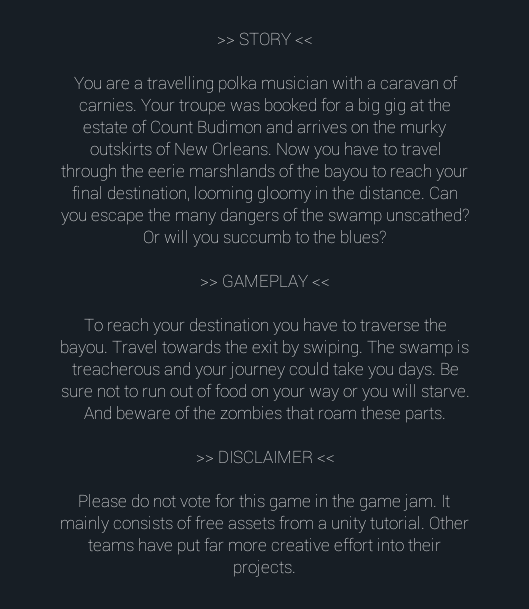 Now you have to travel through the eerie swamps of the bayou to reach your final destination, looming gloomy in the distance. 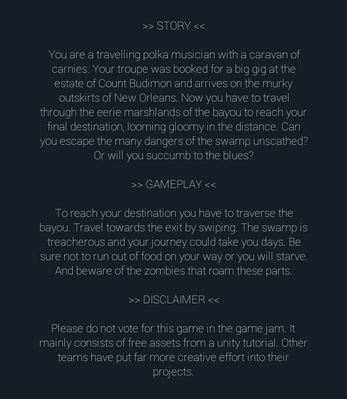 Can you escape the dangers of the swamp unscathed? Or will you succumb to the blues? Gameplay: Fight against the cruel RNG gods of yesteryear and survive Permadeaths constant vicious attemts on claiming your hard-earned ever waning stash of rare eternal soul-stuff... like... in that other game. And all the stuff is randomly generated, for added replayability and more fun, the same way as in all those oldschool rouge-likes you so much enjoyed when you were young. When playing as an @ was still hip and training your little d to steal precious loot from those greedy shopkeepers for you was the bees knees (Who's a good boy? Yes, you are! Yes! You! Are! Have this newt corpse as a treat... Yes! You git gud, Boy!). Alas, nethack your way through hordes of bean-flavored foes and discover the true meaning of the blues. Completely captivating and hightly interactive, thanks to the innovative and slick state-of-the-art touch controls that your android device provides these days. And the highly original and captivating blues-and-polka-infused soundtrack extravaganza produced exclusively for this game by the hottest and most bestest public domain musicians I could find... Will. Rock. Your. World. Overwiew: I will be Following some simple Unity tutorials, testing the 2D features of Unity (since I haven't been using Unity for some time) while working with the included prototyping sprites from the tutorial available from the Unity asset store. Then I will try to switch them out along the way with some handmade pixel art and sprites inspired by the Rocketbeans TV guys in Aseprite. I'll add some story screens working in the two required themes selected for this game: Blues and Jahrmarkt. Then I'll add some custom sound effects and try to find a few polka-and-blues-inspired songs to complement the atmosphere of the story. 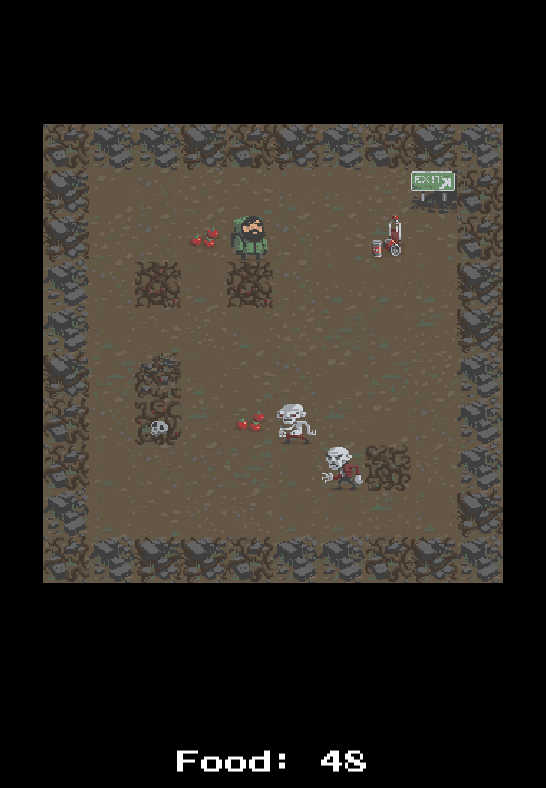 In the end this will hopefully produce a 2D android rogue-like gane apk before the 48 hour timer hits zero. Finally, I'll try to document the necessary steps and all the progress done. Hopefully this'll show others how making games is fun and how this all can easily be be done by anyone if they just try. Title and initial idea created using the awesome video game name generator: https://videogamena.me/. * Aseprite is not for free but you can always download the source code directly from their github repository and compile it on your computer for free, if you know how to do that. *² Sublime Text 3 isn't free, but you can use this text editor without limitations. It will occasionally remind you while saving that you should buy a licence if you enjoy working with it. *³ You really should be using some kind of version control system like github. Note: The game should work on a nokia 7 plus (in landscape mode) or similar devices with a resolution of 1080 by 2160 pixels at a PPI of 403 pixels per inch The content of the game consists mostly of free assets from a unity tutorial, so the apk version is early alpha at best. Download the apk file to your android device. Alter your settings to allow apk installation from the required source.